The past fifteen years have witnessed a fundamental shift in the global business landscape where any small group of individuals, whether employees of large corporations or self-employed workers, can seed and grow incredibly powerful business models with little more than a laptop and a cellphone.First, the explosion of online networks has broken barriers to reach out to collaborators or clients at a cheap price, anytime, and anywhere. Secondly, as digital natives start working, it has become obvious that their approach to networks and collaborations differ from those of older generations whose networks were limited to family, close friends, and business colleagues. This new generation is less focused on company loyalty; they know they will likely change jobs many times in their life, and perhaps will need to travel for work. Networking and flexibility fit naturally into this landscape and process. In some countries, the influence of local policies that encourage entrepreneurship during an economic slowdown has increased the number of micro companies in a big way. 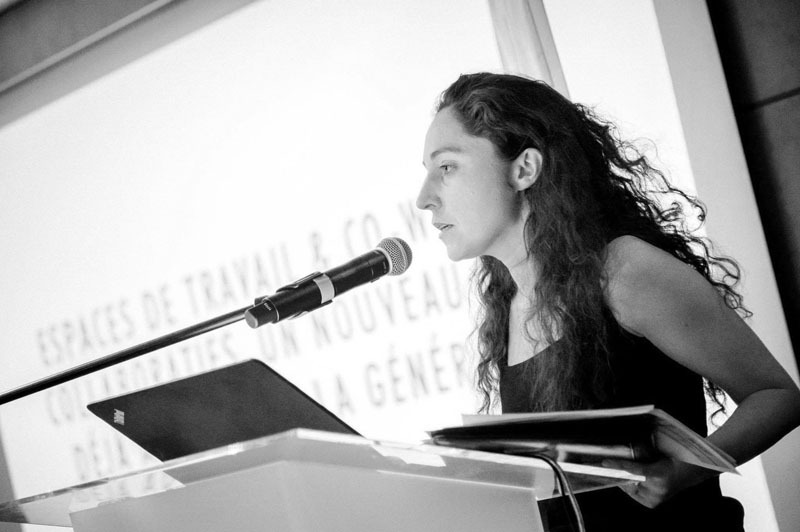 For instance, France created a simplified status for people willing to start as freelance workers. This status is called “auto-entrepreneur,” and was launched in 2008. It generated immediate success: just under 1,000,000 people were registered under this status in December 2014, and about half of them were considered active as of December 2014. In the past few years, coworking (defined by a situation where two or more people are working in the same place together but not for the same company) has rapidly moved from a niche market to a growing alternative to the traditional office, offering the best answer to the development of an increasingly nomadic crowd. According to the “Global Coworking Survey 2015” by the magazine Deskmag, there are indeed today 7,800 coworking spaces in the world (as compared to 3,400 in 2013), gathering an average of 65 members each (against 86 members each in 2013). 61% of the existing coworking spaces as measured by the “global coworking survey 2015” plan to expand in the next 12 months and 44% of members come every day.Although this is a declarative survey, it gives an idea of the strong growth of the demand. 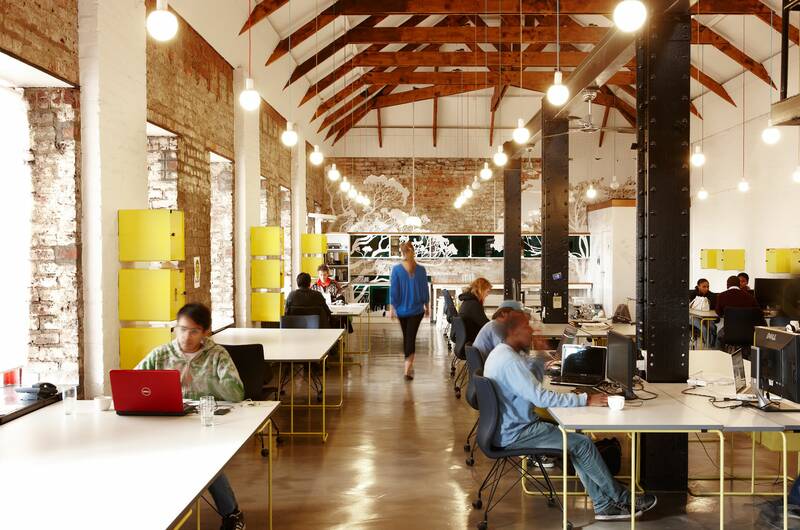 Most coworking spaces offer a system of membership based on a monthly fee which includes renting the workspace itself in addition to social events and other services that build loyalty (such as free refreshments and newspapers). Socializing isn’t forced, but happens naturally. According to the “Global Coworking Survey 2015,” 70% of members of coworking spaces have a strong feeling of “being part of their coworking community,” and more than 90% expect to remain members of the spaces for at least one year. These percentages indicate a genuine enthusiasm, especially given that most of the coworking spaces worldwide do not invest any resources on marketing, and rely mostly on members’ word-of -mouth.The design and aesthetics of a coworking venue are essential to building the image and nurturing the feeling of community. Neuehouse, a selective shared office space operating worldwide, does not define themselves as a coworking space but rather as a home for the ambitious and the curious.Neuehouse creates and contributes to their aesthetic soul by having a selective membership process and welcoming celebrities to their events.With the “Impact Atrium,” we have taken a different approach. We have started to organize social and business events for a community of game changers based in Paris, or travelling often to Paris. We have found our expertise in facilitating business connections and fruitful collaborations between top international decision makers from policy makers to CEOs to Creative Designers across multiple disciplines. At first, our events were in living rooms or restaurants. Then, we rented private rooms in palaces and five stars hotels, but we didn’t find the same intimacy available there. We tried to find a welcoming business center, but we couldn’t find any that reflected our DNA. After studying many options, we decided to create our own venue that will offer a large designed space dedicated to open lounges, as well as social and collaborative areas reflecting our mindset and the DNA of our community. Research of Gretchen Springer, from the Michigan Ross University, showed in the Harvard Business Review, recently measured that co-workers have a strong feeling of thriving compared to other workers. One factor she attributes to this “feeling of thriving” is the decreased competition and internal politics from traditional workplaces; members tend to find it easier to work with people coming from different backgrounds and with different goals, expertise, and projects. As a collaborative environment, it becomes more natural to help other members, and the demographic diversity can positively contribute to each member’s skill set. 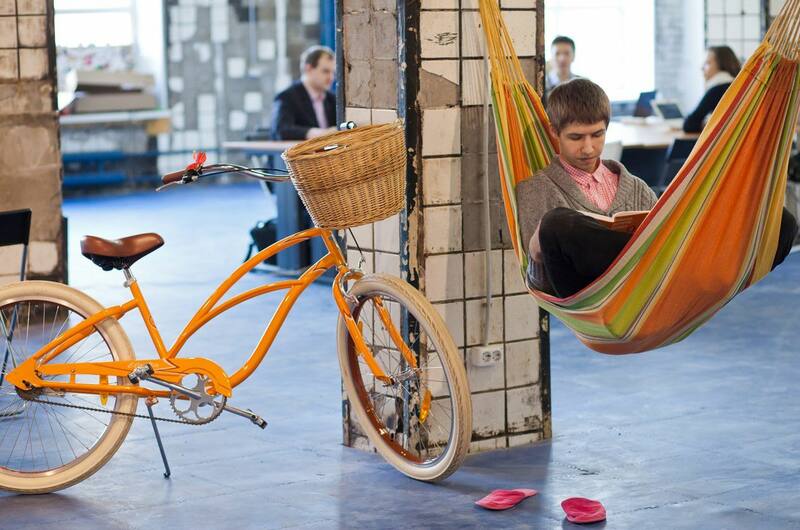 Zonaspace coworking in Saint Petersburg, Russia, creative atmosphere. Flexibility is at the heart of any coworking space. The most basic – and majority – of coworking spaces offer temporary workspace (hourly, daily,or monthly) in either conference rooms or private offices. Many of them are open 24/7 which enables workers to respond more dynamically to their workload - flowing in an out of the office as they navigate their personal and professional lives. time in a private office, and then attend an event in the evening, without ever leaving the building. This multiplicity of space offers flexibility to members,and maximizes the time spent in the venue. • "Value ecosystem" over "value chain"
Coworking services are bridging the gap between what landlords can offer,and what many businesses want.Understandably, it is difficult for newer companies to plan ahead to the same extent as more established businesses. Young businesses are often unwilling, or unable, to commit to traditional lease terms (i.e. a three years, five years, or longer), or to provide landlords with guarantees for the two to three years of rent often required. 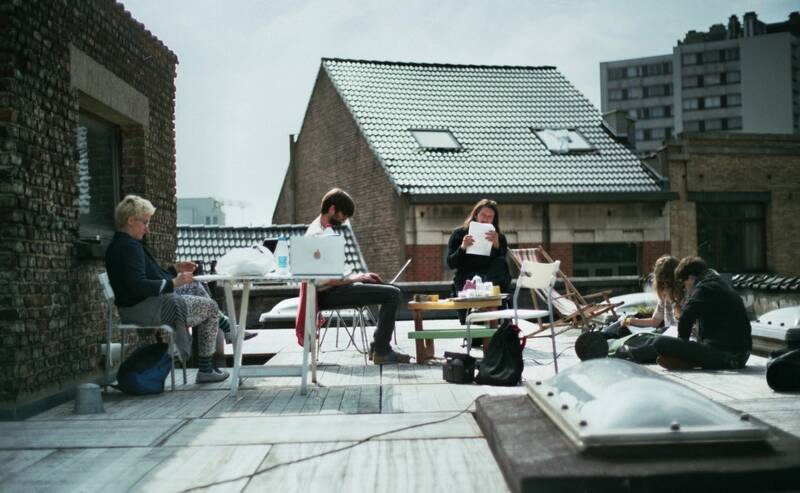 Creating a concept for a new co-working space for artists in Brussels. Additionally, the nomad business community doesn’t want to handle the recruitment for back-office and facilities management. In coworking spaces, operators manage the relationships with landlords and endorse the responsibility for their members.However, many real estate owners are slow to understand this trend, and they often consider coworking as a phase. Based on the “Global Coworking Survey 2015” by Deskmag Magazine, 49% of the respondents said that the spaces were vacant for at least the 6 months before the coworking operators adopted the lease, which is further evidence that coworking is not seen as a primary option for landlords. However, many large companies are following the coworking trend and developing similar values inside their own offices. According to a study by DTZ, in Macquarie’s banking and financial services group, 55% of employees change their workspace everyday at no cost for the company and of those employees, 90% report being satisfied. Slides from the conference can be found here. Established companies are also entering the coworking arena, which should hopefully have a positive impact on the way real estate owners consider this business. Regus, one of the oldest business center companies, is starting a social brand of coworking spaces called “Third Place” in partnership with British Land, a large retail landlord. The famous social & VIP networking club brand Soho House has also recently launched three coworking spaces called “Soho Works”, acknowledging the value of coworking spaces for a high quality of networking. The coworking revolution is inevitable; it has begun already. Coworking appears to be an efficient alternative to traditional workspace environments. It helps generate a collaborative atmosphere, it seems to have a positive influence on attitudes of workers, and it helps answer some of the concerns of a growing crowd of companies, from self-employed individuals to large corporations. Those already involved in this revolution hope that real estate owners continue to understand, embrace, and invest in this trend; adapting their vision for ambitious projects so that this revolution can be joined by more visionaries, entrepreneurs, and established companies alike.